I am sure you get requests like this all the time, but I figured all I can do is ask. A little back story, I am a huge fan of EYE Candy and his progeny. So much that I flushed my best Charolais donor cow to him. I was blessed to have what I feel is a really good heifer, I know owners say this all the time. She is very sound and deep-bodied. I think she can stand the competiton and will make an amazing foundation cow for someone looking to grow their club calf program. Well, I have decided to sell this heifer, because sometime you have to let go of your best to show that you have good genetics. 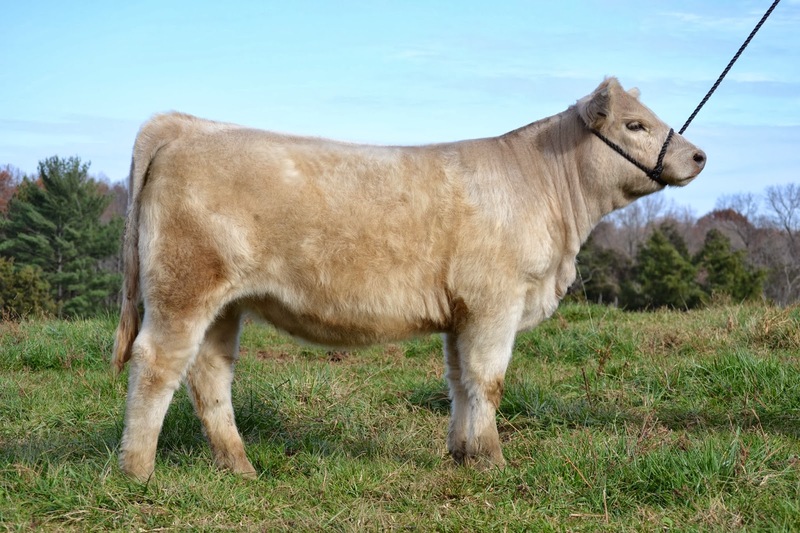 She is selling as Lot 95 in the VCCP Eastern Elite Production sale in Harrisonburg, VA on Saturday, January 25. To make matters I little more difficult for me, I live on the east coast, where club calves are not the first place people look to get a club calf. I think so much of this heifer that is why I am contacting you, hoping that you know someone on the east coast or someone in general, who is looking for a good smoke heifer sired by EYE Candy and will use her to her maximum potential. I also think so much of this heifer that I am keeping two flushes out of her at the convience of the buyer. Any help or suggestion you can give me is greatly appreciated.